A few days ago, on March 6, we gathered to bid farewell to one of the great spiritual lights of Kosovo and Metohija, Mother Efrosinija of Gračanica Monastery. She was one of the few remaining of the nuns who came to live in Kosovo and Metohija in the years immediately following World War II. With their fortitude, endurance, and lives of prayer, they rebuilt and protected the monasteries of the region both during the many years of Communist persecutions and then during the violent pogroms perpetrated against Orthodox Christians living in Kosovo and Metohija by Muslims, which resulted in the forced expulsion of the majority of Serbian Orthodox Christians who had lived for centuries in the region. Mother Efrosinija’s life was a testament to God’s faithfulness and power, of the triumph of light over darkness, and of hope over despair. We could see the great impact she had by the multitudes of monastics and dozens of priests who came from across the diocese of Raška-Prizren and also from central Serbia and Montenegro to pay their last respects, and as we went up to give the final kiss, many of us had the impression not that we should pray for her, but that we should ask her to pray for us. Nevertheless, we processed to the monastery graveyard to lay her into the ground, and we wept, for this great woman of prayer is no longer in our midst to console us. “Blessed is the path which you have set out upon today, for a place of rest has been prepared for you! Blessed is her soul’s path towards the Lord, Whom she loved her entire life, a path laden with the rest, peace, and joy of eternal life. 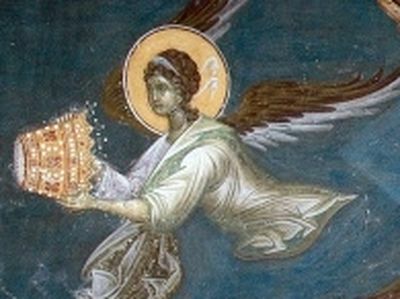 Blessed is the path of her body’s repose, which in its last months was so anguished and feeble, for today, she is laid within the holy earth of Kosovo, of Gračanica Monastery, in which she spent nearly her entire life serving God. Mother Efrosinija’s earthly life was entirely lived under the sign of the Cross, in unconditional service to the Lord, to this holy place, and to her sisters in Christ. She unceasingly gazed into the face of God, which gave her strength for her earthly struggle. In her case, it can rightfully be said that she was a great ascetic of Christ’s love, for from her youth she promised herself to the Lord and then dedicated her whole life to Him. The child Marijana was born 90 years ago in a village near Čačak. Of the eight children born to her parents, she was the sixth. As she herself said later on, it was her father, Mihailo, who instilled in her a love for reading Holy Scripture, while her mother Živka also would complete her life in this very monastery, taking the monastic name Lidija. At a young age, Marijana was left without a father, who had become ill during the First World War and later died of the same condition. In 1948, together with Nun Evgenija, who would be her co-traveler throughout her monastic life, young Marijana came by train to Lipljan, and they then walked to the Monastery in Gračanica, where she promised God that she would live her life as a monastic in the ascetic life. Who could even begin to describe all of Mother Efrosinija’s many ascetic struggles? She was a dedicated laborer and woman of prayer. During the day, she would work hard, and at night pray fervently. She had done all of the obediences in the monastery, both doing farm work and manual labor and also working in the church. She attached great importance to the Divine services celebrated in the church. From 1955 onwards, she was the greatest support to her abbess, Mother Tatiana. Every day, she washed her face with tears of repentance and joy. Mother Efrosinija has truly left all of us with a marvelous example of how to love God with one’s entire being and heart and how to truly serve Him. Under the spiritual direction of blessed Patriarch Pavle, our beloved Mother continuously prayerfully stood before the Lord in pious fear, knowing only Him and His limitless mercy and love. Mother Efrosinija had a merciful heart, she knew how to come to love everyone in Christ, and how to comfort and help each and every one. Her monastic sisters in particular witness to her limitless meekness and goodness. This is why all of us here today pray that the Lord be good and merciful to her! The ascetic labors of our beloved Mother are an encouragement to all of us who live in this holy place and for all of us who have visited it, that just like her, we might endure every temptation that comes to us on Christ’s path, just like this holy place itself, Gračanica Monastery, which has withstood many evils throughout the centuries, and yet today boldly stands before us in its glistening beauty. The example of Mother Efrosinija, who spent her entire life in faith and hope in God, must be constantly before the eyes of her sister nuns, who now must continue in her work so that tomorrow they might meet each other at the Wedding Banquet in our Heavenly Fatherland. 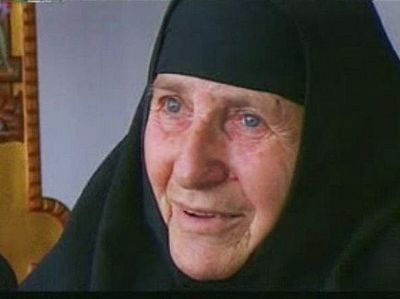 For decades, Mother Efrosinija was a witness to everything that happened in Kosovo and Metohija, together with her sisters and the faithful laypeople. Like a burning candle, she prayerfully shone over the soul of every person, bearing together with them the difficult days of bombing and suffering. She helped and consoled many afflicted souls and housed and fed many refugees. Sensing in her soul that she was nearing the end of this earthly life, she communed every day in the last year and a half with repentance and confession . And so today, her soul is borne on high to God, cleansed and bright, prepared to meet with the Heavenly Bridegroom. Her entire life she devoted herself to this moment, to this day. This is why the Lord will now reward her with incorruptible joy in the eternal Heavenly Kingdom. Even though today she is physically parted from us, she will now always be near to us and with us. With sorrow and with grief we will say goodbye to her today, as we shall no longer see her shining face or hear her gentle voice. But, we also part ways with her with firm faith that the Lord, Whom she served her whole life, will accept her as His own and that He has prepared for her an eternal crown. A town in central Serbia—Trans. 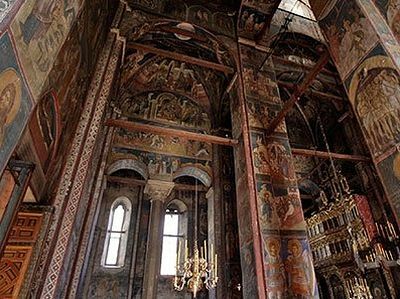 Gracanica is one of the pearls of medieval Serbian culture, and one of the most significant places in Serbian history and spirituality. With its name are connected many works of art and literature, beginning from the middle ages to our own times. In the fourteenth-fifteenth centuries, the monastery was at its height. There were hundreds of monks laboring there, leading intense spiritual lives and developing trades and handicrafts.